Growing up in Goa has had enormous perks, especially in terms of culinary delicacies and cultural experiences. One of my favourites has always been waiting for the tasty treats called patoleo (dumplings) to celebrate the birthday of St John the Baptist, the forerunner of Jesus Christ, on the 24th of June, and the solemnity of the Assumption of the Blessed Virgin Mary (a Catholic dogma that says the mother of Jesus was taken to heaven, body and soul) on the 15th of August, which also happens to be India’s Independence Day. Patoleo are made for Konsachem Fest, or the Roman Catholic harvest festival, which starts off from the Church of Our Lady of Snows, Raia, on the 5th of August and continues through the month in various parish churches on different dates. The harvest festival on the 21st of August by the comunidade (community) of Taleigão of Tiswadi taluka is historically significant since the tradition dates back to 1510, when Alfonso de Albuquerque and his men found themselves stranded and deprived of food after an onslaught by Adil Shah. The people of Taleigão brought nourishment to Alfonso and his men. After Alfonso regained Goa, he granted the villagers the privilege of being the first in the taluka to cut and bless the sheaves of new paddy. The rice, jaggery, and coconut sweet dish obviously made its way into Christian cuisine from Hindu culture. The same patoleo, with a slight variation, are made to celebrate Nag Panchami, the worship of snakes during the Hindu month of Shravana, which begins on 23rd of July, and the harvest festival Navyachi Panchamon which is celebrated on the day after Ganesh Chaturthi (Chavath in Konkani), the auspicious day to pay obeisance to the Hindu god Ganesha. Hartalika Teej Vrat is a fast undertaken by Hindu women in commemoration of Parvati’s penance to secure Shiva as a husband. Hartalika is the name given to Parvati by Shiva, and she was to be worshipped under this name. After the rituals, the women celebrate by eating patoleo. The salt-free patoleo are also offered to the goddess, who is said to have craved them when she was pregnant. Traditionally, Hindus and Catholics have sent patoleo along with the vojem, or trousseau, to the groom’s house. The distribution of patoleo would mark happy occasions such as the birth of a child and the building of a new house. The turmeric leaves used to contain and flavour the patoleo are fragrant, and have healing abilities due to their antioxidant, anti-inflammatory, antifungal and antibacterial properties. The palm or sugarcane jaggery that is used provides a natural sweetener with nutrients. Grated coconut has lauric acid that can increase HDL (good) cholesterol levels in the blood. Variations of patoleo are available, with banana and jackfruit leaves being substituted for turmeric leaves, and additions of dal, jackfruit pieces, raisins, cashewnuts or pumpkin. The simplest recipe, however, calls for a paste made from parboiled rice that is soaked and ground. The paste is applied to rectangular-cut turmeric leaves and stuffed with choon, which is a mixture of coconut jaggery, grated coconut and cardamom. 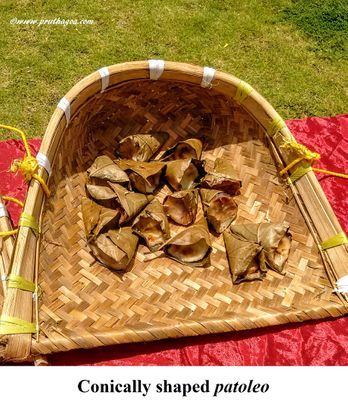 The leaves are folded and then steamed in a confro (vessel for steaming). 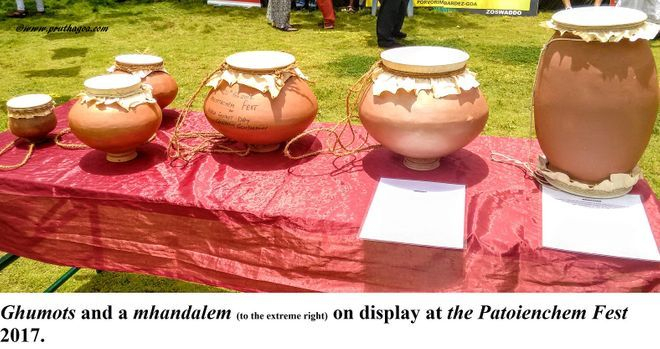 For some years now, Patoienchem Fest has been celebrated at Socorro in Bardez with much pomp and the presence of prominent Goan personalities like Alexyz, Marius Fernandes, Prajal Sakhardande, Miguel Braganza and others. This year (2017), Patoleo were distributed after Fr Santana Carvalho, the Socorro parish priest, blessed them. Cultural programmes were interspersed with talks where Alexyz highlighted World Goa Day and Miguel Braganza spoke about Konkani and its origin to mark Konkani Day. The Goan ghumot had a significant presence with an enormous ghumot and mhandalem (another earthen percussion instrument) made by Akshay Chari with sheepskin stretched over the mouths of the instruments. 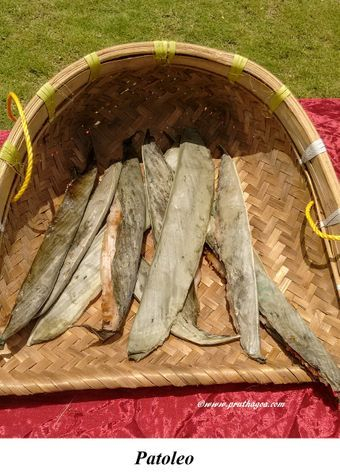 Ghumots were on sale and various items depicting Goan heritage were on display such as shevgo (to make sheviyo or steamed rice noodles) and daantey (grinding stone). 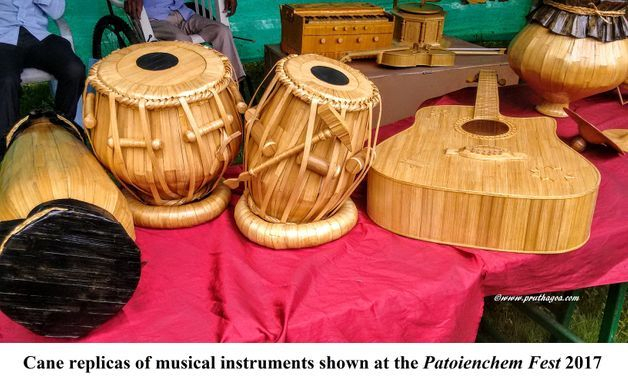 Musical instruments made of cane were showcased too. The quintessential Goan rice, fish curry, sanna, prawn kisnoor, etc satiated the hungry crowd. The no-frills festival is meant to amalgamate various aspects of Goa’s culture to awaken a sense of pride that will motivate our younger generation to work towards preserving the same.